I'm not sure where I got it but I was sick all day yesterday. On Tuesday night I visited the Asheville Buncombe Christian Community Ministry Vets Quarters where we had dinner and then Wednesday I had lunch at McD's. But what ever it was it made me ill for two days. My Mom always puts on a feast for as much family as will show up. Suzanne, my wife, and Mom put on a major spread. My cousin Rick and his wife Jing drove over from Boone to eat with us. I really felt bad not be able be more hospitable. So today I am going to take it easy and recover. I'm starting to feel a little better today. We may go out and brave the Asheville "traffic". We wish all of you a Happy Thanksgiving. Each time our family sits down for a meal we take time to say a blessing over the food. We want to teach our children that prayer is an essential part of our relationship with God. Clay our 7 year old son likes to say prayers that include our horses, the dog, his freind up the street, Mom and Dad and usually a couple of new items he is thinking about. Devin who is 13 sometimes is less enthusiastic about praying in public but she still prays. Many times when you pray you may ask God to change some circumstance or situation you are going through. I've done it, it's not the most mature prayer I have prayed. As we grow in Christ we are expected to not act like new Christians. For example a new Christian may not understand how to read the Bible, the reason for attending a small group study, or making church attendance a priority each week. As we get around other Christians it will cause us to grow and mature in our faith. When you pray don't go to God with a laundry list of your desires. God wants to know your needs but at the same time if you are not applying your faith each day how can you have a healthy relationship with God. The model prayer in Matthew 6:9-13 is a great example of how to communicate with our Father in Heaven. It exalts God, humbles us for He supplies our needs, we are all sinners in Gods Holy sight, be forgiving, temptation is all around us and God will strengthen us, but no matter the situation Gods will is plenty. Today as we all sit down for a Thanksgiving meal remember to thank the One who provides all of our needs and gave us His son Jesus as payment for our sin and brought us into communion with the maker of all. Happy Thankgiving. Here in Western North Carolina we have been experiencing a drought, many of the creeks and springs have run dry. People that depend on wells for their water are struggling to find water for their homes. I was talking with a woman that carries water to her cows from a few hundred feet away. No matter who I talk with I find out that even in difficult times people do what ever it takes to get the job done. Even if it means having to change the normal routine and our level of comfort. Planting the Land of the Sky Cowboy Church has had its' own set of challenges... all of it man-made. 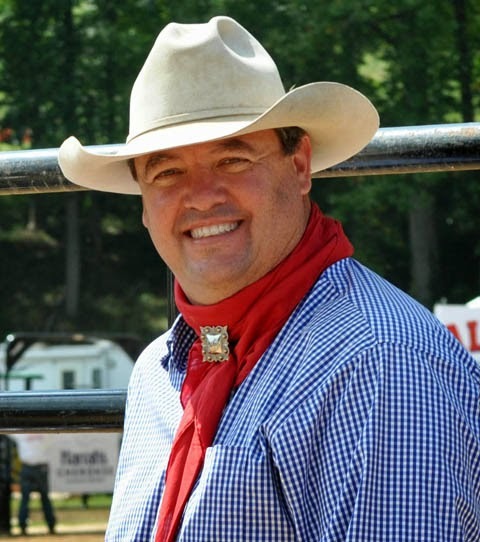 We have a core group of people that want to see Cowboy Church in North Buncombe grow and they have become good friends and people we can depend on. They help provide laughter and encouragement as well as strong hands when there is work to be done. Because of the drought when the leaves were changing this past fall I noticed that they were not very bright. We are surrounded by mountians, it's a beautiful sight. The lack of rain caused the leaves on the trees to look dull, it was still a sight to see. Usually they bright with colors and the mountians appear to have flames running from hill to valley. You could see areas that had been effected by the drought and areas where water was still plentiful. In Acts Paul and Silas were going about their business when they were beaten and thrown in prison. Not something they were expecting that day. Around midnight that night Paul and Silas were praying and singing hymns. When is the last time you were sick or down on life? Did you sing and pray to God or was it more like a pitty party for one? I've been there, and it was a challenge to pray and praise God in difficult times. Like those fall colors, the trees still reached skyward even though to my eye they looked dull, the colors still changed bringing a new season to the Western Mountains. Because Paul and Silas did not allow their personal comfort to interfere with their ministry duty the very guard that imprisoned them came to know Jesus Christ as his Saviour, then the guards entire household came to Christ and all were baptised that night. Remember it was midnight when this was going on. So let's review;, drought, dull colors, surounded, midnight, locked-up and beat-up! Have you got the picture? "Believe in the Lord Jesus and you will be saved". It's that simple. We all have things going on that can distract us from being saved, it is right there for the taking, so take a hold of Christ the Saviour. Psalms 145:10 All your works shall give thanks to you, O LORD, and all your saints shall bless you! Be Thankful, today as you look around you many are hungry and in need of a kind word or a friend with an ear to listen. Christ calls us to proclaim His joy where-ever we are. "Ground Tied" is a term Cowboys use when they can get off their horse and drop the reigns to the ground and not tie them to anything but the horse will not move from that spot even thought he's not tied to a post or a tree. Look at the picture again, there is a fence but the reigns are not tied to it. This horse is not by himself there are three other horses near him and they are all "ground tied", not to mention the 20 people standing near by. There is a lot of activity going on but this horse stands fast and doesn't go anywhere. A cowboy has spent alot of time with this horse training and working him. 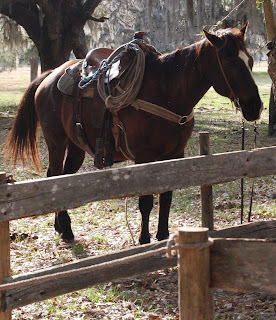 This horse knows his place and waits for his rider to return, pick up the reigns, climb on and go back to work. Gods asks us to wait on Him, Jesus said, " I seek not my will but the will of Him who sent me. ", John 5:31. It is easy for us to have our own will and our own plans and ambitions. Our world is going through a precarious time, tomorrow seems blurred by the news of uncertian terms in finances and politics. Gods will for you is very different you may not see it right now but the way to find it is to stand still in His corral. Those fences infront of you are man made and we insist we be tied to it for security and comfort. But tie that horse to that fence and if he get spooked his 1200 lb body will pull those boards right out of the post dragging that length of lumber around, hurting himself and others around him. Seek Gods will for your life and you will find freedom in you everyday life. God doesn't want to tie you down but He wants to give you freedom. That is freedom from death and sin. His son Jesus Christ has given us that freedom from sin and death because is His death and resurrection on the cross. Today ask God to take hold of the reigns of your life and learn from Him, so you can experience life without being tied to lifes fences. 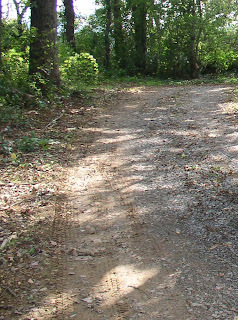 When is the last time you drove down a gravel road that you didn't know where it went? Or have you ever noticed when you drive down a familiar gravel drive you don't always hit the same hole twice. When I drive up the road to our house every now and then I hit a rut and I think "I don't remember seeing that in the road." Some dirt roads are smooth while others have those chatter bumps that resemble speed bumps put really close together and if you drive around 35 mph you seem to skip across the tops but any slower or faster it will shake all of the loose change out from under your seats. And some dirt roads have large holes that seem to appear out of no where. As Christ followers we are going to find the ruts in the road. Our lives don't become easier because we begin to live for Christ, however, we can live free from the constant striving for success and care that the world puts on us. A life with Christ at the center allows us to see the ruts and things that would distract us from living a life full of promise and hope. The promise Christ gives us is that of freedom from sin and hope for tomorrow. God wants the best for you and brings out the best in you if you allow Christ to work through you every day. Even though there are bumps and holes along the road of our journey Christ will lead you through if you let Him. North Asheville Baptist Church invited us to their Missions Banquet, which was Friday November 21. Two of our core members, Scott and Sally, joined us to help pass out information to the visitors at the banquet. We had a great time talking to a few people about Cowboy Church. We have been talking to North Asheville about them becoming a local church sponsor. We put together a short video from our weekend at the Southern Finals Rodeo for the event, so take a look and enjoy. We held cowboy church on Sunday before the rodeo and we had 100 people attend the service. Remember, Cowboy Church is more than Rodeos, we like and support all types of equestrian events, English, Hunter Jumper, etc. Our daughter enjoys English style and has done barrel patterns in her english saddle. It is not necessary to be a pro rider to attend Cowboy Church. Romans 12:2 says be transformed by the renewing of your mind... By not allowing the distractions of the world to take you off track you can begin to understand Gods will for your life. Have you ever thought to yourself...how do I know what Gods will is for me? If you don't ever read your bible, participate in a small group bible study, or attend church you will never know. God wants the best for you and if you spend time with Him - His plan for your life will be revealed. Be intentional in your worship. Join us on a Thursday night at 7 PM in Weaverville, please be our guest. Welcome back, we've been out doing Gods work. This past summer was a challenge like no other. We were focused on the business of ministry and as many of you may already know isn't were God calls us. What I mean is God did not call me to the business of Cowboy Church but rather the delivery of His message through the Cowboy Church. I begin this series with a bit of disappointment, a group that wanted to fund our Cowboy Church at the last minute decided to not fund our Cowboy Church. They wanted us to take COWBOY CHURCH out of our name. This comes from a group of pastors that seem to be more focused on the business of church rather than the ministering of the Gospel. Don't get me wrong I am not disappointed about any of the funding because God is in control and provides my families every need. It did break my heart because of the attitude with which they approached me. All we can do is pray for churches that are holding on to the traditions and things of the past. The bible says old things are past away, 2 Corinthians 5:17. What kind of challenge is the greatest? Is it a physical obsticle that we must over come? Or a mental thought that takes up our waking moments? Each is something we must face but not alone. We can have challenges but the Lord must be our source for all answers. He gives us the abilities and capacity to evaluate the challenges in terms of understanding and acceptance. In turn we make a decision on how to handle the obsticle in our path. Lean on Gods understanding today, make a concious decision to put His will first. I have first hand experience with this. When I try to do it my way and it is contrary to Gods will for my life it falls short of my expectatoin and when it is the way God has planed for me then it seems to be effortless in it execution. Thats a fancy way to say that it works out for Gods purpose. You have a purpose and God wants to show it to you but you must give your life to Christ and ask Him into your heart today.